I’ve realized that I’m quite hard to please… sometimes. I hate when information is handed to me too easily, but also hate when I’m confused beyond comprehension. The latter was my issue when starting Under the Never Sky. Immediately, the author, Veronica Rossi, thrusts us into a new and complicated world. While I started the story frustrated, because of both confusion and the main character’s situation, I ended up very much enjoying the story. It’s almost overwhelming to think of a well-rounded summary without giving away important tidbits of information. There’s so much going on in this book, but it never feels cluttered. I understood why we were automatically immersed into this world right in the beginning. It takes a while to understand everything and how it all works. We first meet Aria, who is a Dweller. Her whole life, she’s lived in this virtual reality, a pseudo earth-like realm where people are always happy and can do the impossible. The Dwellers wear electronic eye patches which allow them to enter the Realms and control what they do. We then meet Perry, who is considered an Outsider by the Dwellers, but really he’s the brother of a Blood Lord to a substantial tribe. Perry is a Scire and Seer, meaning that he can smell people’s tempers (yes, smell what people are feeling) and he has great night vision. It is very rare for one to receive two gifts, and people tend to tread carefully around Perry. Everything begins one day when Perry breaks into the Pods where the Dwellers live, and saves Aria from getting attacked by a companion. In the debacle, Perry ends up swiping her eye patch by accident, which inadvertently causes a new set of problems. On his way to solve them, he bumps into the newly-exiled Aria, and that is when their journey really begins. What I found odd at first was that a story like this changed perspectives almost every other chapter. I’ve gotten used to only hearing the female perspective of epic adventure stories. In this case, it was nice to get to know Perry on his own, not just through Aria’s eyes. While it killed some of the mystery behind him, it vastly helped me understand the kind of world they live in. It’s well detailed, but there are several things that I’m having a hard time comprehending. The Aether, which almost seems like a character in itself, is destroying the world. When the Aether storms, it strikes the land randomly, killing and destroying whatever lies there. It’s also the reason why there is no sky, hence, the title. I understand that it’s dangerous and large in scope, but there are many things I don’t fully understand, and I’m unsure if it’s something that I’m not intended to get right away or maybe I missed a detail. However, it doesn’t take away from the particular story at hand. The more you read, the clearer things become and the more you begin to love the characters. I loved the twists and turns, especially the ones that occurred toward the end. It set up the characters for a new journey in a realistic fashion (even though this world is far from realistic, but you know what I mean). I hate when I get to an end of a book, and I’m totally blindsided by the most ridiculous plot twist because an author wants to leave a big cliffhanger or set up something new for the next book or whatever. With Under the Never Sky, you can tell Rossi is building up toward the next adventure in the last third of the book, and it flows perfectly with the already established plot. All this leaves me desperately wanting to read the sequel, even though this book hasn’t exactly been released yet. It practically goes without saying how much I (the hard one to please… sometimes) enjoyed Under the Never Sky. It’s recommended to anyone looking for something more sci-fi on the dystopian spectrum (that virtual reality thing is pretty sci-fi, right?). Also, because I’m girl, I must make note of the adorably breathtaking romance that the story offers. 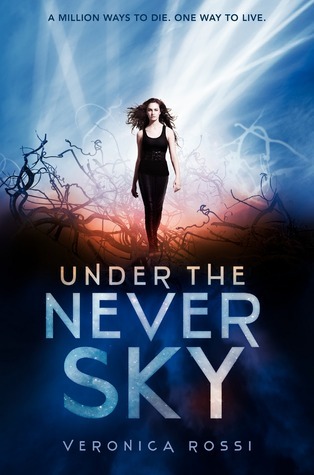 So, if you’re looking a great story with a bit of science fiction, paranormal , dystopia, interesting characters and romance, Under the Never Sky is a must. Under the Never Sky hits bookstores tomorrow, January 3rd. You can purchase it at our TYF Store by clicking here. Next ArticleMusic news: Kele from Bloc Party reveals that the band will release a new album this year!